From scheduling and prerequisites to dropping a class to getting waivers, all the most common questions we receive are answered here. Are students allowed to make changes to their schedule? Yes, before the start of the school year, 4 days will be designated for schedule changes. Each grade level will be assigned a specific day. Once school starts, schedule changes will be permitted over the first 5 days. What is the last date a student can drop a class? Students are allowed to drop a class during a semester only if they do not already have a study hall. All classes must be dropped by December 1st for the first semester and May 1st for the 2nd semester. Can students choose for PE and Weights to not count towards their GPA? Yes, if a student chooses to not count their PE or Weights grade toward their GPA, they must notify the guidance counselor by December 1st (first semester) or May 1st (second semester). Are students required to take a study hall? No. Students can choose to take either 8 academic classes or 7 academic classes and a study hall. Starting in 2018, any high school student who is involved in athletics or marching band can apply for a PE waiver. This waiver allows students to not take PE in order to take another academic class or study hall. Students can also receive a PE waiver if they need a specific class to graduate high school or if they need a specific class for college enrollment. How does a student get a PE waiver? PE waivers are considered on a case by case basis by the principal and guidance counselor. Students will fill out a PE waiver form that they can get from the guidance counselor. In order to get a semester PE waiver, the student must participate on one athletic team or the marching band during the semester they waive PE. If the student ends up not participating in the activity or quits the activity mid-season, they will be removed from their class and placed back into PE. Students do not need to take Chemistry I to take Chemistry II. Chemistry II is a more advanced class that is geared towards students who would like to take AP Chemistry. If a student chooses to take Chemistry I they can still take Chemisty II. Adv. English I: Students have earned an A BOTH semesters, completed entrance exam and summer work, and received a teacher recommendation. Adv. English II: Students earned an A/B for BOTH semesters of Adv. Eng. 1 or an A for BOTH semesters of Eng. I. Students need a teacher recommendation and must complete summer work. What are the requirements to take AP classes? AP US History: Due to the writing intensive AP National Exam, sophomore students must either have passed Adv. English I with a B or better, or currently be in Adv. English II. Juniors and Seniors must have earned a B or better in both English I and II. All students must have completed World History with a B or better. AP Chemistry: Students must take Chemistry II and earn an A or get a teacher recommendation. AP Language: Must have an A or B for BOTH Semesters of ADV Eng II or AP Lit, or Equivalent, an A For BOTH semesters of Eng II & III, or Teacher recommendation. AP Lit: Must have an A or B for BOTH Semesters of ADV Eng II or AP Lang, or Equivalent, an A For BOTH semesters of Eng II & III, or Teacher recommendation. Can students take two math classes at the same time? Yes. In order to take 2 math classes at the same time, students will need to have earned an A in math the previous 2 semesters and receive a teacher recommendation. The best two classes to double up in math are Geometry and Algebra II. Can students take two science classes at the same time? Yes. If a student decides to do this, we recommend taking Biology and Chemistry at the same time. What is the first Art class a student should take? The first Art class students will be able to take is Design. Students must pass Design to be eligible to take all other Art classes. 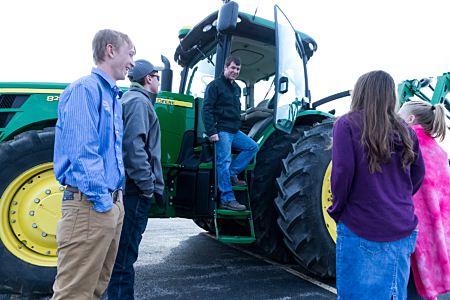 What is the first Ag class a student should take? The first Ag class students will be able to take is Intro to Ag. Students must pass Intro to Ag to be eligible to take all other Ag classes. IVS is an online school that provides course offerings that MFHS does not currently provide. Students must have a cumulative GPA of 4.0 or higher to register for these courses and receive credit for completion from MFHS. Grades earned from these courses will not count towards the student’s GPA, but can​ be added to the student’s MFHS transcript. This includes the Advanced Placement courses offered. **Note: Those students taking Advanced Placement classes will be required to take the AP exam at a location other than MFHS. MFHS will not administer the AP exam. Students are allowed to take one Online Supplemental Courses (OSC) per semester, provided they are currently enrolled in 7 classes at MFHS. Students must begin and end the course with the course dates that most closely align with MFHS semester. Payment for these courses must be made in the high school office prior to the course start date. Courses are available through IVS for students in grades 9-12 that have previously failed a course. Grades for these courses are Pass/Fail and will not count towards the student’s GPA. Students have two options for credit recovery. The first option is a condensed course at a reduced cost. Condensed courses are 12 weeks long, but do NOT include instructor assistance. The instructor grades the material, but does not provide assistance. The second option is the full course (17 weeks), which includes instructor assistance, and is available at full cost. The FULL payment is due to the high school office prior to beginning the class. All credit recovery work must be completed by the deadline stated in the guidance office. Second semester seniors need to have ALL CREDIT RECOVERY WORK COMPLETED BY MAY 15th if they plan to go through the graduation ceremony. 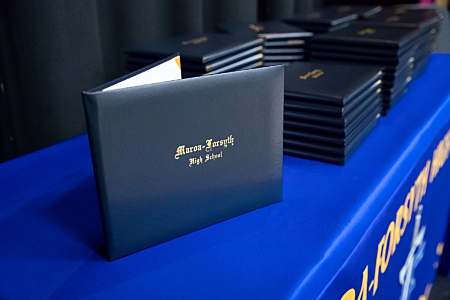 When students successfully complete dual-credit courses, they receive high school credit, as well as credit at Richland Community College (RCC). When a student plans to attend another college or university, it is recommended they check with that college or university to be sure the credits their son/daughter will be earning transfer as intended. A 3 semester hour course will be equivalent to .5 credit at MFHS. A maximum of two online courses during the school day will be allowed per semester. A student must be enrolled and in attendance on a daily basis at MFHS for at least 5 classes excluding the dual credit courses. Dual credit courses are offered through RCC on their campus and online. All dual credit courses must be pre-approved by the principal. The student is responsible for the appropriate placement testing, enrollment procedures, and payment to RCC. Enrollment will be available to junior and senior students who have a cumulative GPA of 4.0 or higher. Students must also meet enrollment requirements for RCC. Can a student get their permit early? Yes, as long as the student meets all age requirements, students who meet the passing requirements on their Driver's Ed pretest can get their permit early. What are the requirements to take Driver’s Ed? In order for high school students to take driver’s ed they must have received a passing grade in at least eight courses during the previous two semesters (junior or senior high school). How are students scheduled for driver’s ed? Students are placed in the classroom portion of the class according to their birthdate. Behind the wheel is also scheduled according to their birthdate. How many days of class can I miss before I am removed from driver’s ed? Students are removed after 6 days of absences. Focused Learning is a 27 minute period at the end of the school day. This period is designed to allow students to get additional help in all subject areas. Students will be assigned a Focused Learning class but will be able to get passes to see any teacher they need to see. How can Seniors opt out of Focused Learning? Any Senior student can choose to opt of of Focused Learning and leave early if they have a cumulative GPA of 4.0 or higher at the start of their senior year. Any senior who is on honor roll during the school year can opt out of Focus learning after the 1st quarter. If a Senior student does not earn honor roll status during their senior year, they lose their opt out privileges. Is tutoring available at Maroa-Forsyth High School? The National Honor Society provides tutors for any student needing help before school from 7:30-7:55. Tutoring after school can be arranged by appointment. Tutoring options are also available on the guidance website. How does a student earn an exam waiver? A student may be excused from taking one semester exam of his or her choice if they earn a cumulative average of 90% or higher in a class for the semester, or have excellent attendance and a 80% or better in the class. Excellent Attendance is defined as not having missed more than 5 school days in a given semester. School sponsored activities will not count as one of the five days. College days are counted against the student’s absences. In addition, three disciplinary consequences (detention, in-school, or out-of-school suspension) in a semester will negate a student’s ability to waive a semester exam. This policy applies to both first and second semester. Senior 1st semester exam waivers: Students who score between 1000-1999 on the SAT will earn an additional exam waiver. Students who score a 1200 or better will be allowed two additional exam waivers. Senior exam waiver for 2nd semester: Students will be exempt from taking their exams in any class they have a “B” or better and they have missed 10 or less days of school for the entire school year. Any unexcused tardy or absence from school will negate this waiver. Heartland provides career exploration and training for high school juniors and seniors, with most classes offering college credit.